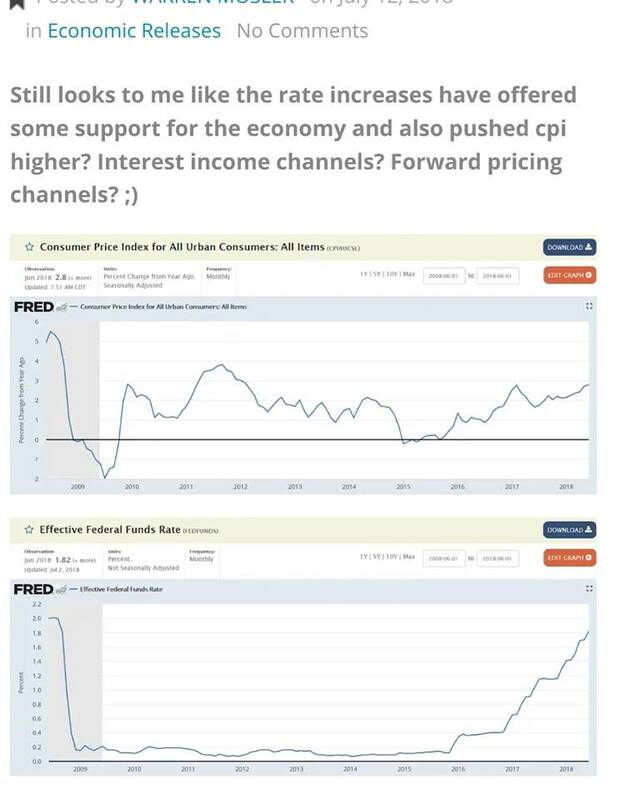 The reason rates are rising is because we are reaching or at full employment (something FAKEMMTERS reject hence their political Soviet style ‘job guarantee’). The economy has been improving. As a result you will see some inflation. BUT! Core inflation remains at 2.3%. Most of the inflation is from oil rising to $74. That is why it’s pure fukkery to say ‘oh look higher rates caused inflation’. Bullschitt! If we were not near or at full employment and oil was $45 inflation would be in the toilet! Higher rates are a RESULT not a CAUSE of higher inflation. Paying higher interest to savers (pension funds, the Buffetts of the World, banks etc.) DOES NOT CREATE INFLATION. Savers DO NOT SPEND THEIR SAVINGS (If that were not true, trickle down economics would have been a massive success story)! It’s a ridiculous assertion. No pension fund is going to run out and start buying iPhonesX. As for the other dumb assertion that the cost of borrowing rises therefore prices rise: Bullschitt too. Forget the fact with rates so low it has no impact on borrowing costs. We live in a Global economy! Companies can borrow from all over the world at the lowest rates possible. We don’t live in the stone age! Oil has a far bigger impact on inflation than 2% interest. $1 trillion deficits have a much higher impact on inflation than 2% interest. $1.5 trillion tax cuts have a much bigger impact on inflation than 2% interest. I have zero tolerance for people who scam other people. ZERO!! !